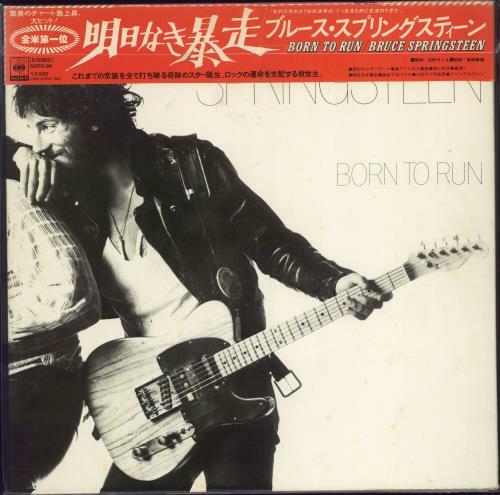 BRUCE SPRINGSTEEN Born To Run (Original 1975 Japanese 8-track LP, housed in a gatefold picture sleeve with fold-out biography/Japanese insert & horizontal top obi-strip. Any Springsteen collector needs this as it shows The Boss at his best & serves as a great reminder of how incredible the late Clarence 'Big Man' Clemons really was on his finest moments Jungleland & Thunder Road! The sleeve shows some light foxing, mostly on the reverse and a small corner crease to the obi, whilstthe vinyl has just a couple of faint hairlines leaving it Excellent SOPO-96).